Learn how to automate advertising reporting and data gathering. For any digital marketer, it is extremely helpful to navigate among a whole bunch of metrics that are collectively referred to as conversions. These metrics can be found in advertising platforms, site tracking solutions and even backend databases that store, for example, offline transactions. We will however be limiting this post to only discussing online conversions. Knowing how conversions are defined and applied across different advertising platforms is instrumental in understanding what insights they offer and in what contexts they are relevant. Different types of conversions can provide you with different perspectives on the results of your marketing. Some will help you to assess cross platform performance and other will allow you to take platform specific conditions into account when judging the results of your marketing. Take this into account when you begin to explore working with conversions, as you should choose which conversions to set up accordingly. A major significance in how conversions are treated is between Google Analytics and advertising platforms. In general, Google Analytics will be better suited for those who want a uniform way of defining conversions and treating channels. Evaluating conversions individually based on how they are defined in each ad platform can provide a broader perspective on how conversions are being driven. Both solutions have their pro’s and con’s, the former sacrifices flexibility and the latter increases complexity. We will delve into this through examples of how Google Analytics and a few platforms work with conversions. We will be taking a look at how conversions are generally defined and used in a few different platforms. The idea is not to walk you through the exact technical details and configuration of each individual conversion, but rather provide an easy-to-read introduction to different types of conversions and what characteristics can set them apart. 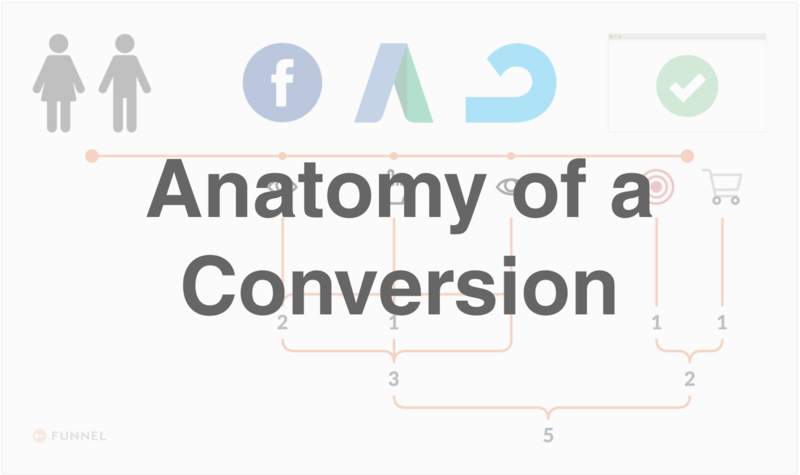 To create a basic and general description of them, we will be dividing the anatomy of conversions using two main features; their objective and attribution. As has already been mentioned, a key takeaway is that Google Analytics and advertising platforms will define conversions more as rule rather than an exception. This primarily stems from the fact that all Google Analytics conversions, whether it’s Goals or Transactions, are click-based. Most ad platforms will offer their customers the possibility of using click-through and view-through conversions, as well as conversions that combine click- and view-through attribution. Google Analytics will basically throw any preferential treatment of your advertising channels out the door and your ad platforms will provide a more comprehensive approach, although their accredited conversions are likely to overlap between each other. We will be exemplifying the main points of the post through general descriptions of how conversions work in Google Analytics, Facebook, AdWords and Adroll. These are all big players in the field of digital marketing and ad analytics, but they also represent separate media and platform types. Additionally, they each have solid documentation for any further reading you might want to do on their configuration of conversions. Let’s start out by going over the conversion type fundamentals of this common web analytics application. Google Analytics provides a useful way of measuring conversions and an understandable model of defining them. In this blog post we will only be using Google Analytics as our example of this being done through your site performance tracking solution, but there are other capable products out there that can get the job done. In Google Analytics there are two main ways of measuring a conversion, which can then be viewed in reports as metrics: Goals and Transactions. Goals can be achieved once within a session on your site, this is the most crucial difference that sets it apart from Transactions. A user can of course achieve separate Goals within their session, but never the same one twice. On the other hand, a user can potentially complete multiple Transactions within each session. So we are already running into some interesting stuff here - both Goals and Transactions are conversions but work in fundamentally different ways. Goals can be useful in measuring standalone conversions (user booked a demo, spent a significant amount of time on site, etc.) or to set up conversion funnels (e.g. how many steps of a checkout the user completed). This is where Goals are appropriate since they are “unique” conversions. Transactions are useful for counting multiple conversions per session, e.g. the amount of orders a user placed or how many deposits a user made at an online slot machine. Furthermore, each conversion can be associated with a different revenue value. So Transactions are the obvious choice for accurately measuring and calculating a total conversion value generated by your site. An additional value with Transactions is that Google Analytics provides you with several related metrics that are especially useful for e-commerce marketers, such as Shipping, Tax, Quantity and more. Facebook offers users a way to track conversions and the value they generate off-platform. This means that you can collect important information on what your Facebook marketing has yielded on whichever site they are directing your audiences to. Facebook’s method for this is setting up a pixel, which requires technical implementation both within your Facebook advertising account and on your site in order for it to work properly. A common type of pixel is Purchase Conversion, which is useful for any online business looking to drive conversions that entail some sort of monetary transaction on their site. The value for this pixel is commonly set to the value of each conversion, e.g. the value of a pair of shoes ordered by the user. So far, this sounds a lot like Transactions in Google Analytics, but Facebook’s definition of when they will attribute a conversion to an advertisement served through their platform is quite different. The default attribution window for Facebook pixels is that the user should have either seen your advertisement within the last day or clicked on it within the last 28 days before converting on your site. If either of those two conditions are met, Facebook counts a conversion and adds its value to their performance reporting for your campaign. Note that this is done regardless of the user having been in contact with your campaigns served by other advertising platforms, prior to or following exposure to your Facebook advertisement. So Facebook may be taking credit for conversions that other advertising platforms also count as having been generated by them! As you can see, we can boil down what makes a conversion in Facebook (and most other platforms) to two distinct parts that are equally crucial to its success. The first is how the conversion is set up in code or implemented technically, i.e. what it is meant to measure and count. The second is what is generally referred to as an attribution window, or the timeframe within which a customer that has come in contact with your advertisement will be regarded as a valid source of conversions. The attribution window for a Facebook pixel is not set in stone and can be adjusted to suit your sales cycle. The Facebook pixel can be set up for other purposes too, such as tracking conversions on Lead Ads and more. Much like Facebook, AdWords uses their own tracking in order to accredit conversions to advertising done through their platform. For this conversion tracking to work, it also requires some implementation on your site in most cases (one exception is phone call tracking). Basically, a user that you have reached with your AdWords campaign has a temporary cookie associated with them. When they eventually complete some action that you have defined as a conversion, that cookie is recognised and AdWords attributes that conversion to their platform. The lifetime of an AdWords cookie is 30 days and is generated when a user clicks an ad in one of your AdWords campaigns. This means that after 31 days, that user can no longer produce any conversions for AdWords to count, so the click-through attribution window is 30 days. Note that this condition differs from that of the default Facebook pixel attribution window. 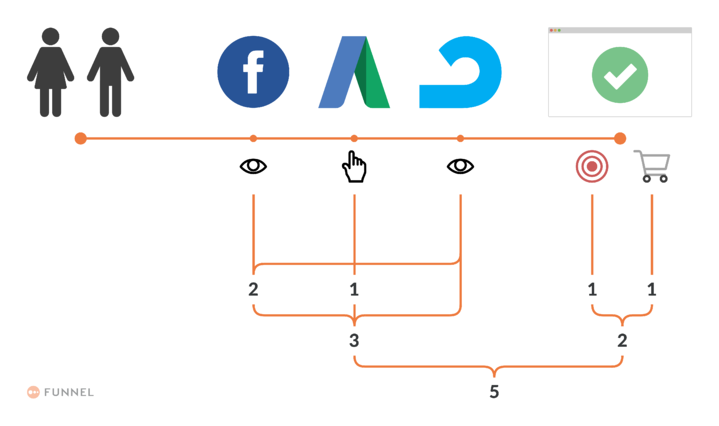 This is important to point out because it is indicative of the variety of ways in which ad platforms and tracking solutions can define what a conversion is and when it is valid. AdWords does offer a way to look beyond just click-based attribution. View-through conversions are measured as an individual metric, separate from the “standard” conversions. The click-through and view-through attribution conditions are not combined in AdWords, unlike what you are able to do with Facebook pixels. Our third and final example of ad platform conversion tracking is that of AdRoll, which also use a pixel for this purpose. The AdRoll pixel can also be set up to track anything that you view as a conversion on your site. Again, this will require some implementation on your site for AdRoll to be able to recognise if a conversion has occurred. You will also need to make sure that you have your advertising account properly prepared for conversion tracking. Similarly to Facebook and AdWords, the AdRoll pixel can count conversions in different ways, which affect the on site implementation. Depending on how you set it up, a conversion can be defined as a user landing on one or multiple pages, navigating to a particular URL or as a specific event is triggered on your site. Furthermore, AdRoll also supports both click-through and view-through conversions. The default attribution window for AdRoll click-through conversions is 30 days and 7 days for view-through conversions, but you can adjust to this to better match your objectives. What makes AdRoll extra interesting is that as a retargeting and prospecting platform, it serves ads across many different audiences in various levels of your marketing funnel. This means that they potentially touch a large amount of the users that arrive on your site and produce one or more types of conversions that you find valuable. Having the possibility to deploy AdRoll’s conversion tracking gives you a perspective on the degree of involvement that their platform has on your customers - are they generating a lot of activity late in the marketing funnel or are they complementing your other initiatives and driving synergy? Conversions can be counted and summed up differently, depending on where you choose to direct your focus. Zooming in more closely, we can see that this customer journey(see image below) produces two View-through Conversions and one Click-through Conversion. As a whole, the user’s interactions through to them completing a purchase, generates four different types of conversions and a total of five conversions. In essence, there really is not one objectively better solution for tracking conversions - the possibilities for defining your conversions are varied enough to suit your needs through most platforms. However, focusing on conversion data provided your site tracking solution versus your ad platforms will shift perspective. On one hand, using Google Analytics as your “source of truth” on conversion data will give you a homogenous treatment of incoming traffic and performance - in a sense, you are saying that “all channels are created equal”. On the other hand, diving into advertising platform conversions can open up a broader view of how your marketing activities are contributing to site performance and offer more flexibility through additional conversion types with customizable settings. Of course, you might find that the optimal solution for you is a hybrid approach that takes both schools of thought into account. For example, when you need to optimise your campaigns the ad platform conversions are necessary, while Google Analytics helps you with an ”apples and apples” comparison of channels. Depending on the purpose and sales cycle of a conversion, they can be configured and implemented in various ways. In our examples, we described and exemplified two main parts that make a conversion: their objective and their attribution window. Objective dictates where on your site a conversion should be measured and what kind of event or action it should be triggered by. Attribution is a way of defining how much time is allowed to pass since a customer’s last contact with an advertisement before is is no longer seen as contributing to the objective being accomplished. We are hungry for feedback! At Funnel, we believe that interaction with marketers is what drives mutual success. Please leave us comments or send us your thoughts on this subject, and teach us something new!